A whirlwind tour during the Pope’s visit to to Washington, DC. to be one of his two guests when Pope Francis came to Washington, DC. 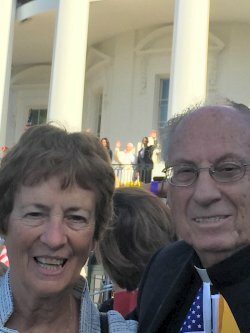 Sister Peggy joined Father James Nock from East Hartford, Connecticut for this amazing journey, which included being at the White House, the Basilica, and Congress, It was, indeed, quite the whirlwind tour. As reported in the East Hartford Gazette, Congressman Larson said. "It is an honor to bring Father Nock and Sister Peggy to Washington. Father Nock presided over my children's baptisms and communions, spoke at my Dad's funeral and was at my mother's bedside when she died. Sister Peggy has devoted her entire life to service, her community, including where we both grew up in Mayberry Village. They are both pillars of the community and I could not be prouder to have them join me for this historic occasion." "This was an overwhelming experience," Sister Peggy said. "I didn't know what to expect. This was the first time I had been to the White House and there I was in the Rose Garden. I looked across from our seats and there was Vice-President Biden and his wife, Secretary of State John Kerry and Ethel Kennedy. Representative Nancy Pelosi and her family were a few rows away. We had the chance to speak while we were waiting for President Obama and Pope Francis to arrive and talked about her alma mater, Trinity Washington University. Sister Peggy further commented on her experience as the Pope arrived. "I can't explain the feeling. There was an energy that was electric and yet there was also strength and calmness that emanated from him." At the Basilica, Sister Peggy met Sisters of Notre Dame de Namur, Kristin Matthes, Mary Johnson and Josita Colbert. "I felt so much a part of Notre Dame and wanted to share it with my sisters, but had no idea how we could connect in these massive crowds—and yet we did find one another. 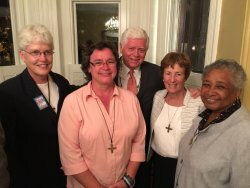 I was able to invite Sisters Kristin Matthes, Mary Johnson, Josita Colbert and Sister Pat Twohill, OP a Dominican sister who is staying with Sisters Mary and Kristin to a reception Congressman Larson was having for us that evening. Ironically, it turned out that the Dominican sister was a student in the seventh grade at Saint Aedan's School in New Haven, Connecticut when I taught second grade there early in my ministry. The Notre Dame connections were all around. It was an experience of a lifetime."